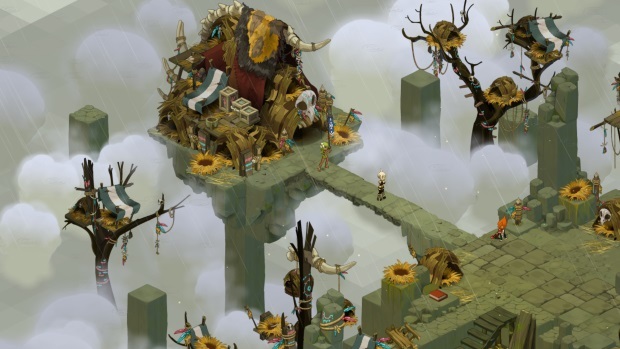 Ankama announces details about Wakfu‘s main quest: conquer Ogrest. This ogre is responsible for the flood that destroyed the World of Twelve. Very early in the game, after playing through the tutorial area(Incarnam), players can meet the terrifying Ogrest, who has been sitting at the top of Mount Zinit crying his heart out ever since his girlfriend left him. His tears, which are magnified by the 6 magical Dofus eggs in his possession, are what caused the great deluge. And now, in the Wakfu Era, Ogrest continues to create chaos and disrupt the ecosystem. Players will have to try to incapacitate this ogre so that the World of Twelve can be rebuilt. Mount Zinit, the game’s main quest, offers a completely new gaming experience. Alone or in groups, players will be able to progress gradually through the quest’s storyline. While climbing Mount Zinit, the player will discover quests, monsters, bosses, and unique areas – all filled with danger and adventure. Players will have free access to the first chapter of Mount Zinit when the new patch is live on 15th February, 2012. Mount Zinit, which is a key element in the story of WAKFU and its transmedia universe, can be seen at the end of the first season of the WAKFU animated series and also in the Xbox Live Arcade game Islands of Wakfu. So long as Ogrest is up on Mount Zinit, Chaos will descend regularly on the world’s territories, disrupting the ecosystem and destroying various interactive elements (such as workshops). When Ogrest’s Chaos hits, every nation will suffer at the same time (one randomly-selected territory in each nation will be affected). Each time these Chaos events take place, acommunity challenge will be triggered, asking players to unite in order to end the disaster by fighting against the Chaos plants and monsters. The latter can attack resources or monster seeds in the area, and when players defeat them, they will receive experience and may even drop exclusive items. Once the challenge has been completed, the Chaos will stop wreaking havoc, but a certain amount of damage will have been done. Then, it will be up to the citizens to band together and supply the resources needed to restore the damaged areas. This collaborative response to disaster helps to reinforce the community aspect of the game.